A hacker group claims to have obtained documents shedding light on the activities of a London-based NGO that officially has a noble mission: to "defend democracy against disinformation." Instead, the project, known as Integrity Initiative, was reportedly used by London to interfere in the domestic affairs of European countries. The online hacker group Anonymous said on Friday that the British government has created a "large-scale information secret service" across Europe, the US and Canada to meddle into the domestic affairs of European nations. Citing a "large number" of leaked documents, Anonymous claimed that Integrity Initiative, a network of clusters across Europe and North America launched in autumn 2015 to "reveal and combat propaganda and disinformation", was in reality a project funded and operated by London through "concealed contacts in British embassies." As the most vivid example of the project's activities, the hacker group cites its operation "Moncloa" in Spain, which was allegedly launched earlier this year to stop Pedro Baños, a colonel known for his pro-Russia sympathies, from being appointed the new head of Spain's influential intelligence office. The Spanish chapter accomplished its task "in several hours," the report says, preventing a pro-Russian voice from shaping Spanish policy. 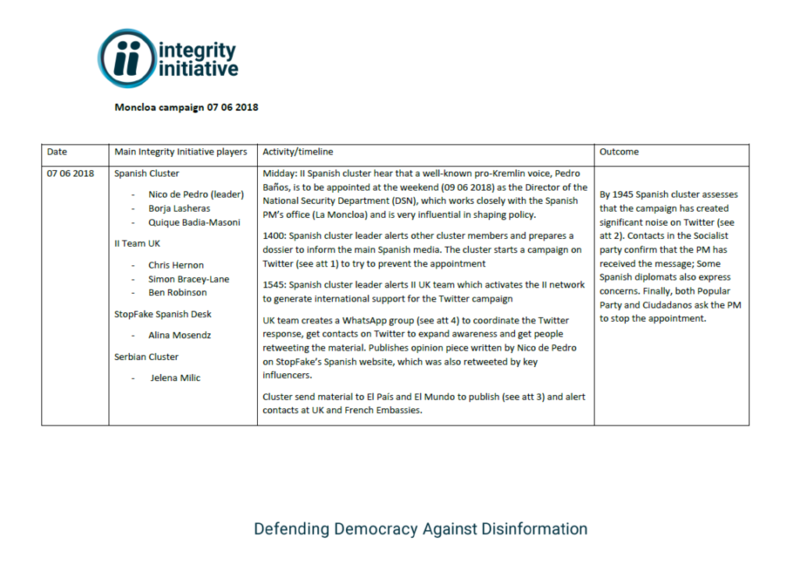 According to the documents Anonymous published, Integrity Initiative's Spanish cluster kicked off a campaign on Twitter in June 2018 to stir up media turbulence and prod Spanish political parties to ask Prime Minister Pedro Sanchez to scrap the appointment. Anonymous maintains that British intelligence is able to conduct similar operations in France, Germany, Italy, Greece, the Netherlands, Lithuania, Norway, Serbia, and Montenegro. The group claims that London seeks to create similar clusters across the globe in the long run, including in the Middle East, North Africa, the US, and Europe as part of "quiet colonisation of both former British neighbors in the EU and NATO allies." "All the work is done under absolute secrecy via concealed contacts in British embassies, which gives rise to more suspicion that Britain uses plausible excuse to create a global system of information influence and political interference into the affairs of other countries." The docs also showed that the Integrity Initiative's costs for the fiscal year ending on March 31, 2019 were estimated at 1.96 million pounds ($2.51 million). 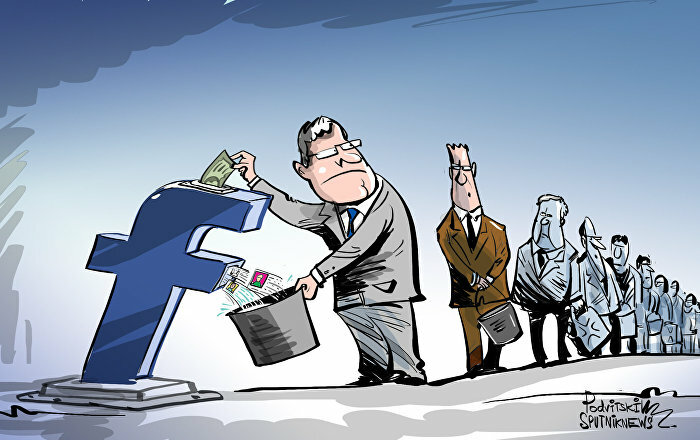 Apart from the UK government and NATO, the program is founded by Facebook, the US State Department and other governmental and non-governmental structures, according to the leaked files. The UK government as well as countries mentioned in the report have yet to comment on the leak. Anonymous is a hacker movement advocating "freedom on the internet" and protesting against internet censorship. The group was launched in 2002 and has since hacked several government websites. The hacktivists strongly oppose terrorist groups: the group declared cyberwar on Daesh* after the November 13, 2015 series of deadly attacks in Paris. Perhaps the most popular action associated with Anonymous was the so-called Million Mask March against "government control." *Daesh (aka IS/ISIS/Islamic State) is a terror group outlawed in Russia and many other countries.